U.S. Commerce Secretary Wilbur Ross, center, leaves his hotel in Beijing, Saturday, June 2, 2018. Ross has arrived in Beijing for talks on China's promise to buy more American goods after Washington revived tensions by renewing its threat of tariff hikes on Chinese high-tech exports. 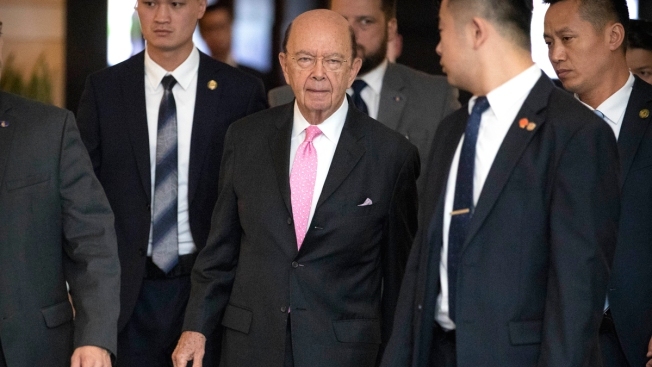 U.S. Commerce Secretary Wilbur Ross arrived in Beijing on Saturday for talks on China's promise to buy more American goods after Washington revived tensions by renewing its threat of tariff hikes on Chinese high-tech exports. The talks focus on adding details to China's May 19 promise to narrow its politically volatile surplus in trade in goods with the United States, which reached a record $375.2 billion last year. President Donald Trump threw the status of the talks into doubt this week by renewing a threat to hike tariffs on $50 billion of Chinese goods over complaints Beijing steals or pressures foreign companies to hand over technology. Private sector analysts say that while Beijing is willing to compromise on its trade surplus, it will resist changes that might threaten plans to transform China into a global technology competitor. Administration officials stress this is only a proposal and so far, the tariff threats are only a war of words, but China has already made threats of their own. Chinese leaders say they are prepared to tax 50 billion dollars in American products, from soy beans to jumbo jets. The two governments released no schedule for the talks, but China said earlier that Ross was due to be in Beijing through Monday. Reporters saw Ross outside his hotel at midday Saturday but he didn't respond to their questions before he got in a car and was driven away. Ross is scheduled to meet with Vice Premier Liu He on Sunday. China has promised to "significantly increase" purchases of farm goods, energy and other products and services. Still, Beijing resisted pressure to commit to a specific target of narrowing its annual surplus with the United States by $200 billion. Following Beijing's announcement, U.S. Treasury Secretary Steven Mnuchin said the dispute was "on hold." But the truce appeared to end with this week's announcement Washington was going ahead with tariff hikes on technology goods and also would impose curbs on Chinese investment and purchases of U.S. high-tech exports. The move reflects growing American concern about China's status as a potential tech competitor and complaints Beijing improperly subsidizes its fledgling industries and shields them from competition. Foreign governments and businesses cite strategic plans such as "Made in China 2025," which calls for state-led efforts to create Chinese industry leaders in areas from robots to electric cars to computer chips. "The U.S. focus on so-called industrially significant technologies heightens the risk of escalation between the two countries," BMI Research said in a report. 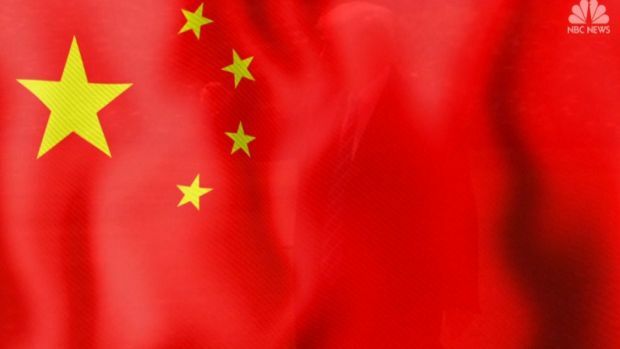 "Indeed, while China has shown itself willing to compromise in the area of trade deficit reduction, it will not take any actions which threaten its strategically important 'Made in China 2025' program." Trump also has threatened to raise tariffs on an additional $100 billion of Chinese goods, but gave no indication this week whether that would go ahead. Earlier, China responded with a threat to retaliate with higher duties on a $50 billion list of American goods including soybeans, small aircraft, whiskey, electric vehicles and orange juice. It criticized Trump's move this week and said it reserved the right to retaliate but avoided repeating its earlier threat. Trade analysts warned Ross's hand might be weakened by the Trump administration's decision Thursday to go ahead with tariffs on steel and aluminum imports from Canada, Europe and Mexico. That might alienate allies who share complaints about Chinese technology policy and a flood of low-priced steel, aluminum and other exports they say are the result of improper subsidies and hurt foreign competitors.